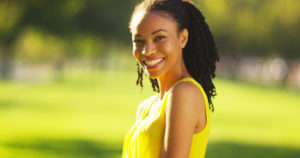 Beauty is all about proportions — and when it comes to your smile, having the ideal amount of visible tooth enamel to gum tissue is important for looking your best. If you have what is often called a “gummy smile” that is afflicted by too much gum tissue, we have good news. Your cosmetic dentist in Cocoa Beach can help! Keep reading to find out about how. A few factors may cause your smile to look a little “gummy,” but the most common is just genetics. If your top lip pulls back a little farther, more of your gum tissue may be exposed than you would like. Or perhaps you were just born with more tissue covering up your tooth enamel than is ideal for aesthetics. Sometimes, wear and tear caused by nighttime teeth grinding can cause the front teeth to look a little short. Whatever is the cause of your gummy smile, there is a beautiful solution in cosmetic dentistry. The treatment that is right for you depends on several considerations, including what caused the gummy smile as well as your budget and personal smile goals. When you schedule a cosmetic consultation with your dentist in Cocoa Beach, you will discuss all of these factors in detail to determine the method that will suit your smile best. Gum recontouring is a treatment in which your dentist uses a soft tissue laser to zap away at excess gum tissue, artfully reshaping the appearance of your gum line. The laser improves upon the traditional method, which requires a scalpel and stitches. Crown lengthening involves lifting some of the excessive gum tissue to reveal more of the white tooth enamel that lies hidden beneath. This procedure is often performed when more tooth enamel needs to be exposed to place a crown or other restoration. Porcelain veneers are a good option for healthy but cosmetically imperfect teeth. If yours appear too short or stubby — and make you look like you have a gummy smile — then these thin porcelain coverings can remake the appearance of your smile. Porcelain veneers are placed over the course of two visits to the dentist and can last for 10 years or more with proper care. 2018 can be the year you finally do something about your gummy smile! Now that you know a little bit about how your dentist can improve the appearance of your uneven or excessive gum tissue, do not wait to get in touch with our office to get started. We can’t wait to help you love your smile! Your Cocoa Beach dentist is a well-known provider of superior dental services ranging from general checkups and cleanings to advanced gum reconstruction procedures. To learn more about what is available or to schedule an appointment, please do not hesitate to contact the office at 321-783-7514.